I find portraits the most challenging subjects since you need to capture the likeness of the person whereas a tree is always a tree. To paint a particular person you need to take extra care. Me painting a young woman on a fair with a Samsung Galaxy Note tablet. 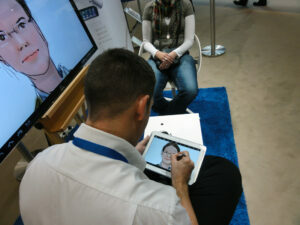 On business fairs I drew many many portraits using smartphones or tablets with a pressure sensitive stylus pen. 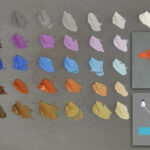 With modern technology you not only have an Undo functionality but also other effects which help you to be faster and create effects of different appearance. But the videos by James Gurney encouraged me to use Gouache and watercolor paints as a traditional medium. 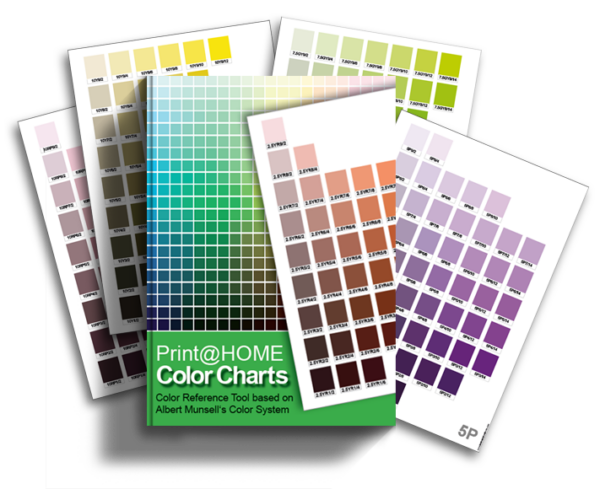 Gouache has the benefit of being an opaque watercolor and therefore behaves kind of like oilpaint – just mixable with water which is easier to clean on location. 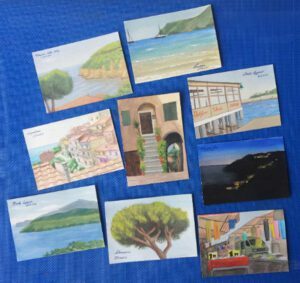 The postcards I painted during vacation on Elba/Italy. Inspired by the video “Gouache in the Wild” (see the trailer here and buy it on Gumroad here) I painted landscape paintings during last year’s vacation on Elba/Italy on postcard watercolor paper from Fabriano and sent these to my familiy and friends. I also sent James Gurney one of these postcards as a thank you for his inspiration and contribution to the art world. Please visit his website and his YouTube channel. 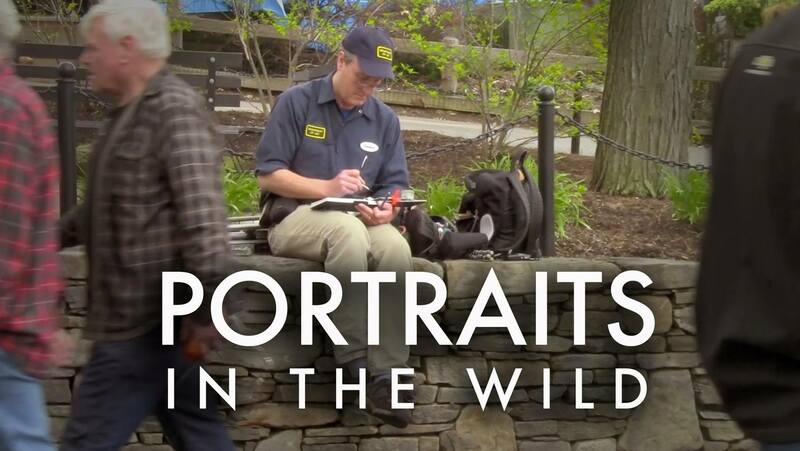 On June 13th, 2016 he published a new video – “Portraits in the Wild” which is especially interesting to me because of the aforementioned reasons that I love doing portraits. James Gurney takes us to four different occasions with four different media: ink filled waterbrushes, Gouache, oil paints and Casein. Without much of talking he jumps right into the first painting – a public scene where people are moving constantly. He is not trying to be super precise but rather tries to capture the gestures of the figures. For example he combines different bodyparts into one figure and changes other elements just how they appear in front of him. The second portrait is one of a historic reenactor who answers James’ questions and therefore is moving his head all the time which makes it especially challenging but lets him appear very alive in the painting. 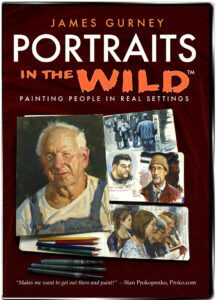 The third portrait is a gathering of several painters at a stable and you get the chance to see the different approaches of the other ones as well as James Gurney’s full head and shoulders portrait in oil paints. He paints the stable owner in three hours and the end result resembles the sitter perfectly. In the fourth scene he paints a singing group which makes it also very difficult to keep the track. For this multi people portrait he needs to change decisions all the time. 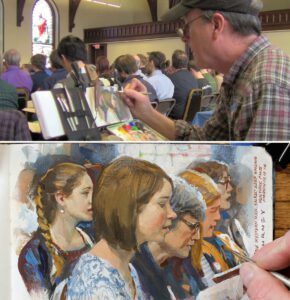 This video is not so much about technical information on the materials but rather about the challenges, the approach and the thought process during portrait painting “in the Wild” when people are moving all the time. What I learned from this video was to not be too hesitantly with making corrections and overpainting areas. Especially with the singers in Casein or the reenactor in Gouache I first thought “oh no, don’t do that” when he overpainted the faces but in the end it was the better choice and it wasn’t a problem at all. In the video James explains when he can make changes and when not.